Tamiya has long been well regarded for the excellent sculpted figures included in its kits. And now there are two more sets for model fans to enjoy. 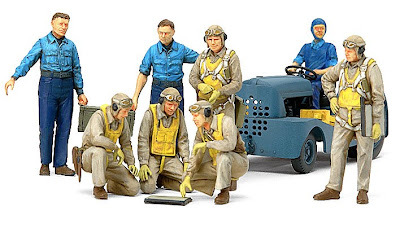 First off is a group of World War II US Navy figures to 1:48 scale. You get a trio of kneeling pilots poring over a chart before a mission, plus a pair of standing pilots looking on. In shirtsleeve order are two groundcrew lugging an ammo box. And to finish the set off nicely, an aircraft tug is provided, complete with driver. All in all this group will do a lot to enhance any 1:48 scale US Navy scene of the era. 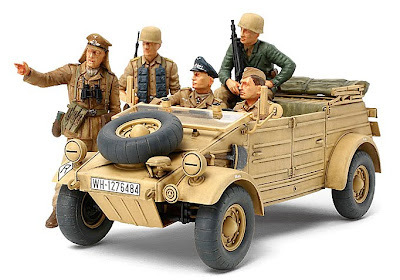 The second Tamiya set is to military 1:35 scale, and the main feature here is a 109 mm (4.3 in) long Volkswagen Kubelwagen in desert sand finish, complete with officer and driver at the wheel. Three more figures set off the little Kube nicely, and as with the US Navy set, this group will enhance any North Africa combat diorama of the era. Incidentally, the name Kubelwagen was short for ‘Kubelsitzwagen’, meaning ‘bucket-seat car’. The rear-engined vehicle could reach around 80 km/h (50 mph), and was widely used by German forces throughout World War II. It was designed by Ferdinand Porsche for VW to assemble - more than 50,000 were produced from 1940-45. These two sets will be available through model stores and online suppliers; meantime there are various Kubes available already, including those shown here.